Minnie Shaw Stewart studied an art Foundation at Canterbury of Art and completed a BA in Fine Art and Italian at Exeter College of Art. She has exhibited at London Contemporary Art; Michael Parkin Gallery, Belgravia and Needham Street Gallery amongst others. Minnie says ‘In 1998 I moved to West Berkshire…and having spent several summers working on a large close-up river series, on the banks of the River Lambourne, I moved back to panoramic landscape. I work mostly in oil on board, mostly in situ, on both large and small scales….often being drawn back to the same spot on Lambourne Downs’. 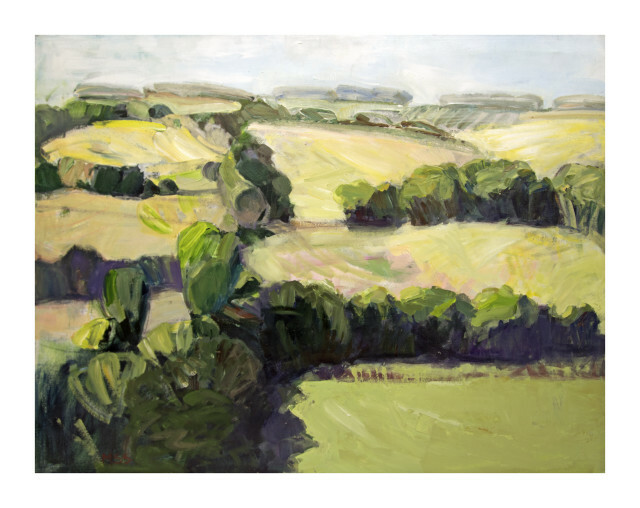 We love Minnie’s use of vibrant, verdant greens, which encapsulate the bucolic English countryside at its best, and her loose, expressive brushstrokes which communicate the wild and woody landscapes that surround her.